Peter and Rochelle recently contributed a tip of the day to the American Evaluation Association’s AEA365 blog, which offers great daily nuggets of evaluation wisdom. We’ve reposted their contribution below. Let us know if you end up using this method in your own Developmental Evaluation! Hi there fellow evaluators. We’re Peter Rudiak-Gould and Rochelle Zorzi, evaluation consultants (and obsessive seekers of better ways to do things) at Cathexis Consulting in Toronto, Canada. We’d like to share a simple trick that makes Developmental Evaluation much easier and more productive. Cool Trick: Each month, focus the Developmental Evaluation process on a single “Burning Question,” formulated by the program staff with some coaching by the evaluators. The Burning Question is the single most important thing that the program staff need to figure out that month, in order to design or run the program effectively. Hot Tip: We recommend actually using the phrase “Burning Question,” because it communicates a sense of urgency and relevance. Once the program staff have decided on a Burning Question for the month, help them to identify some very easy data collection that they can do within the month to begin to answer it. At the next monthly meeting, reflect on what’s been learned about the previous month’s Burning Question through that data collection. Then decide on the next month’s Burning Question and how it will be answered. (Next month’s Burning Question can be the same as the previous month’s Burning Question, if it still feels urgent and needs further investigation). 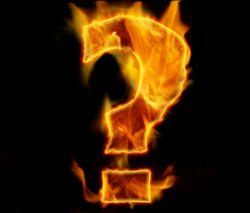 Lesson learned: The Burning Question technique gives a bit of structure and predictability to the Developmental Evaluation process – program staff won’t know what question they’ll be tackling each month, but at least they know that there’ll be a question! The technique also makes sure that the process focuses on information needs that really matter right now, rather than data collection for its own sake. As trust in the process builds, program staff can start to tackle more ambitious evaluation activities: bigger questions with longer-term data gathering, KPIs, a dashboard…But they won’t do any of this until they’ve gotten a flavor of evidence-based decision-making – and that’s where the Burning Question shines.